Thus, Equation (8.4) specifies the velocity, , of each mass element as the body rotates with fixed angular velocity about an axis passing through the origin. 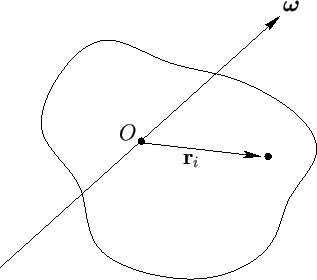 Figure 8.1: A rigid rotating body. Here, it is understood that and are both column vectors, and is the matrix of the values. Note that is a real symmetric matrix; that is, and . In general, the angular momentum vector, , obtained from Equation (8.13), points in a different direction to the angular velocity vector, . In other words, is generally not parallel to . Finally, although the preceding results were obtained assuming a fixed angular velocity they remain valid, at each instant in time, if the angular velocity varies.